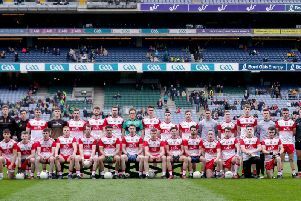 Eoin Bradley has confirmed he will NOT be rejoining the Derry Senior Football panel this summer but claims the county must reassess a policy of prematurely writing off players in their 30s. The Glenullin forward was a frustrated spectator during last week’s Championship humbling by Tyrone in Celtic Park but claimed even if he was approached at this stage, he would not return to the Derry shirt. It doesn’t matter if you are 35 or 36 years of age. If you are scoring 1-10 a game or eight or nine points a game, why are you not on the county panel? It is the same if you are 17 or 18. Have they asked you to return? “No, I probably wouldn’t go back because of the fact I have missed out on so much training and those players within the squad have been working very hard all year,” explained Bradley. “It wouldn’t be right on those players who have trained there four or five nights a week all season. “I still keep in contact with all the players but it is not just me. I think there are four or five players who should be playing for Derry at the minute and are not; there are plenty of people within the county thinking the same. “It is frustrating. Those players on the panel are my friends and I have played with most of those boys for the best part of the last 10 years. You don’t want to see those boys losing, especially losing to Tyrone. “Of course you want to be playing, but with circumstances as they are and with Glenavon, I can’t play, or Damian thinks I can’t play. “That is probably me retired from Gaelic on a county level. They won’t keep coming back to me. I think there are enough good players within that panel and in the county that they could bring three or four in. I’m not talking about myself but there are boys scoring highly at club level. Everybody knows who they are but they are not there and they should be, no matter what age they are. “It doesn’t matter if you are 35 or 36 years of age. If you are scoring 1-10 a game or eight or nine points a game, why are you not on the county panel. It is the same if you are 17 or 18. Why are you not there? ‘Skinner’ is targeting further Championship glory with his club and says he is enjoying life in the Irish League with Glenavon though he thinks at least one member of the Bradley household should be in Damian Barton’s thoughts at present. “Patrick is still scoring well in the league and the Championship. I know it is Division Two at the minute but a scorer is a scorer and there is no question over his pedigree. So if he has the pedigree, why is he not there and it is not just him. Conleth Gilligan is another one. Kevin McGuckin at midfield for Ballinderry. When you play Ballinderry, Kevin is always one of the best players on the pitch, why are these players not involved? “Maybe they don’t want to be, I don’t know, but the midfield has lost Fergal and Patsy over the last year which has left a big void. I’m not blaming the players. I’m just saying, surely with the players in Derry we can be a stronger panel and that would make for a stronger team. “I don’t know what Damian’s tactics were last week but after 15 minutes they didn’t work but it is only one game. It is not a season. If Derry got a favourable draw in the qualifiers, they could still be playing in the middle of August.